Warning: This software may provide a feature to "clean" your registry. We suggest avoiding this feature. MSConfig Cleanup is a small and lightweight program which can help you manage which programs start up with Windows on boot. The utility, as the name may suggest, can cleanup the entries lingering around in MSConfig. In other words, it is an alternative to MSConfig. MSConfig Cleanup provides access to different types of startup items including Windows services, third-party applications and even spyware and malware infections which start with Windows. Once an item has been removed from startup, it is permanent. This has a side effect of not being able to restore it at a later date if you decide it actually should be included. Creating a system restore point would be prudent here. Otherwise, MSConfig Cleanup can be a useful utility to have if you're cleaning up after a malware infection or you're just not interesting in having programs like update checkers run every time your computer boots. 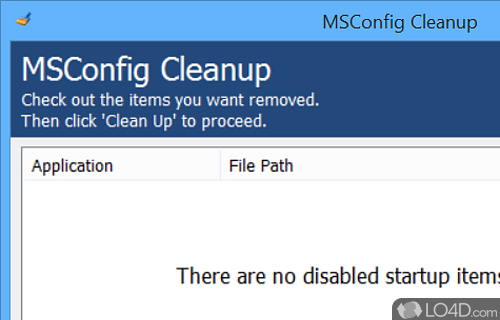 MSConfig Cleanup is licensed as freeware for the Windows (32-bit and 64-bit) operating system / platform from system cleaning software without restrictions. 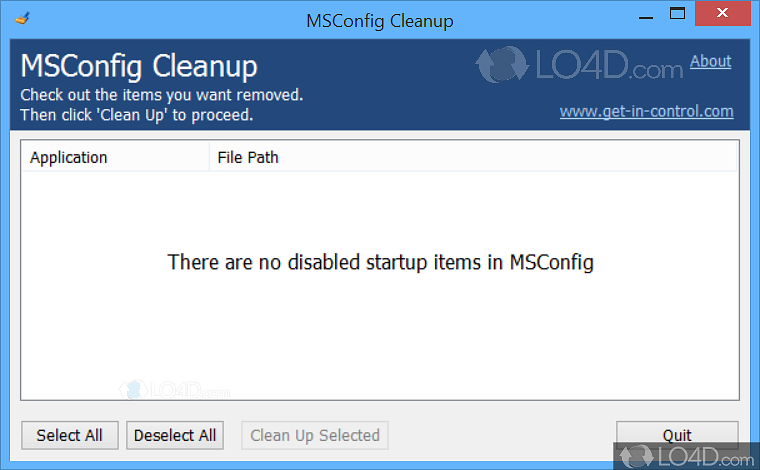 MSConfig Cleanup 1.53 is available to all software users as a free download (Freeware). Compatibility with this startup management software may vary, but will generally run fine under Microsoft Windows 10, 8, 8.1, 7, Vista and XP on either a 32-bit or 64-bit setup. A separate x64 version may be available from Virtuoza. This download is distributed as msconfig-cleanup-setup.exe. We have tested MSConfig Cleanup 1.53 against malware with several different programs. We certify that this program is clean of viruses, malware and trojans. 4.5 out of 5 based on 17 ratings.